You can boil the fiddleheads for less time if you prefer them with more texture, though they can make you ill if not fully cooked. That’s on you. As for the mayo, the volume means using a small blender jar or food processor. If you haven’t got either, double or triple the recipe to use a full-size processor and refrigerate the rest for another day. In a suitable pot, bring the water to a boil. Add the salt and fiddleheads. Boil for ten minutes, drain and set aside. Place all mayonnaise ingredients except oil in a small food processor or blender jar. Slowly drizzle in the oil with the machine running. Set aside. Place a frying pan on medium heat and add the sausage. Cook, stirring occasionally until browned (approximately 10 minutes). Add the fiddleheads to the sausage, gently stirring occasionally for three minutes. 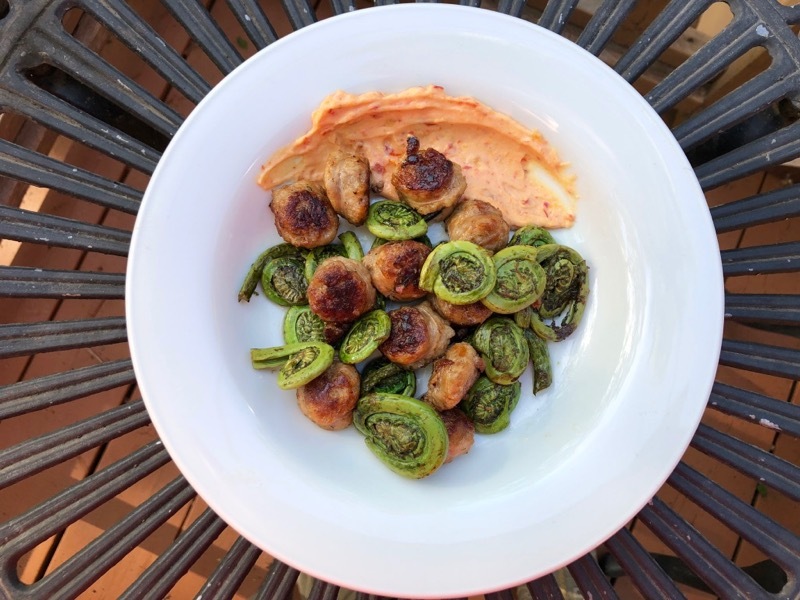 Immediately serve the fiddleheads and sausage with mayo on the side.